So there; I said it. Welcome to a brand new Foto Frenzy. Pop and I disagreed on which foto to use as lead but I won out. Heh heh. I think by now everyone knows the rules of this feature. No photoshopping, no cropping and you take a chance by picking the fotos. When it was in the budget, TW and Pop were purchasing beer to have with their weekly pizza. They’d try a different brand to find one they really liked. They did find one but found out it was owned by Coors, which they boycott. HHGutt convinced them to buy this Mexican cerveza beer. TW thought it would make a cute Cinco de Mayo foto when she saw me sniffing the box and she tried to lure me into it. She did get me into it but unfortunately the resulting fotos didn’t turn out as great as she thought they should be. What a surprise! My handsome Flynn picked #2310. 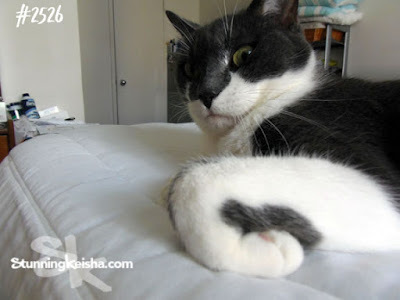 Last week I posted #2525 and it was a pawsome foto where I showed off my stunning feriousness for all to see. I remarked that I wasn’t pleased with TW for wakng me up and she better warch out. Andrea, Celestial Kitties mom, wanted to see what happened next so she picked #2526. I don’t look too pleased. It was taken one minute later so I can’t claim that she wasn’t able to record the carnage cos there apparently wasn’t any. Heck, I can claim anything cos it’s my blog. It’s a good thing you couldn’t see what happened during that minute! "Yo! I’m up here!" CK shouts to da Tabbies o' Trout Towne who axed to see foto #67. When I was younger, I actually used to climb up on the door to TW’s room. The peeps were scared that I couldn’t come down by myself. Sometimes I jumped to the floor. Once TW actually brought a chair in so I would jump on it. Did she think I was some kinda wuss? I haven’t been up here in years but I might surprise TW one day when she least expects it. What great heights are you scaling this weekend? Can I pick? Can I pick? Can I pick? I would like to see #1224 and/or #2449. Okay? That door picture is really something! These are winners, for sure! My Mommy says she will be all liquored up by tomorrow night if I have to go into the vet. - Preslee. 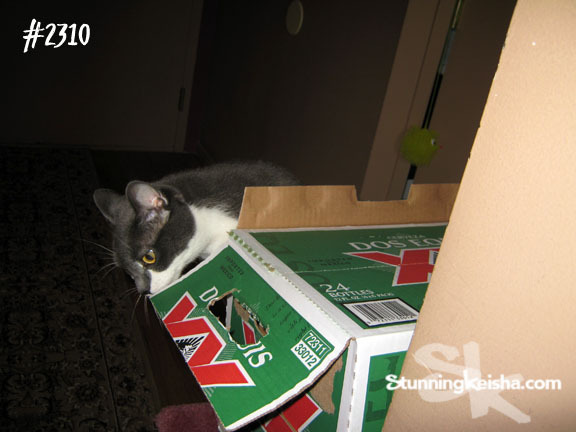 We got photos of us in liquor boxes too, MOL! I'm totally impressed by the last photo, CK! None of us kitties here have ever been on top of a door! Binga got on the beams of the living room once when she first moved into our house, but that's about it. BTW, my human drinks cheap champagne splits to unwind at the end of the night, so really, she is as bad as your humans. Those were fun ones CK and your door skills are amazing! Oh my, #67 foto is amazing! My boys have never climbed up on the door. That sure was scary for your peeps! Beer and pizza...now I'm hungry!!! Mudpie hasn't scaled any doors yet which actually kind of surprises me! MOL, you look like you're recovering warily from whatever you did in between those pictures! 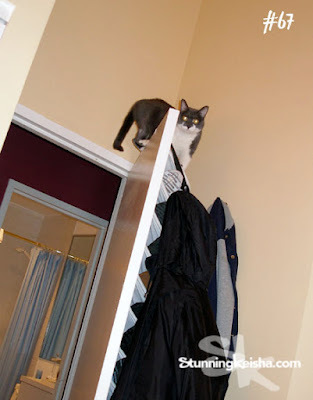 Oh my gosh, I'd FREAK if I saw a kitty on top of a door like that! Can we see 123 next?? OMC Weez always in awe of you kitties dat climb da doors and walls CK. Luv yous fotos. You are juSt amazing when you climb up to the top f a door and just h.ang out. Great photos. OK, the jig's up....how did you get on top of the door? No, I don't believe you flew up there. OH CK we admire your ability to get into high spots. WE need to get up on a door. Can we pick again...ummmm how about 1956. OMC, CK! How'd you get up there??? Great photos, you sure were wild when you were younger :) Phoebe picks 2473, no reason, she just came up with it. Kudos, CK!! I've never done the top of the door stunt ..... ever!! !